The son of a shoemaker and farmer, Adams became a highly successful lawyer in Massachusetts and was among the first great champions of American independence. He was a leading member of the Continental Congress (1774–1777), author of his state’s constitution (1780), signer of the Treaty of Paris ending the American Revolution (1783), first American ambassador to Britain (1785–88), vice president under George Washington (1789–97), and the nation’s second president (1797–1801). 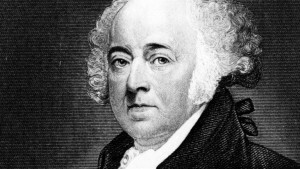 A radical in the Revolution, Adams was a conservative force after it.